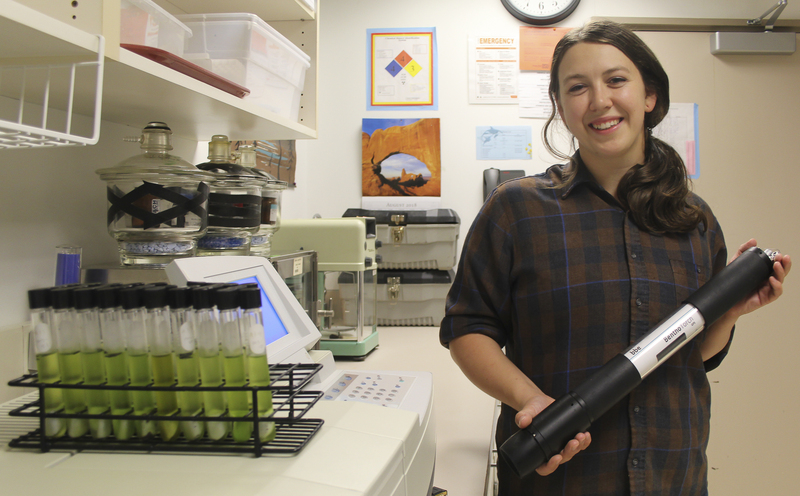 Emilee Mowlds was introduced to undergraduate research in her junior year when she applied for a position counting salamanders and cutthroat trout through Oregon State University’s College of Forestry Mentored Employment Program. While working in OSU’s H.J. Andrews Experimental Forest that summer, Mowlds, a natural resources major, then learned about the Research Experience for Undergraduates program and applied for that as well. The Research Experience for Undergraduates is a National Science Foundation funded 10-week summer research opportunity. Students have to propose a question they want to test using the scientific method and then execute the project. Mowlds proposed to validate a commercial instrument, the BenthoTorch, which is used to measure chlorophyll content in algae cells through fluorescence. 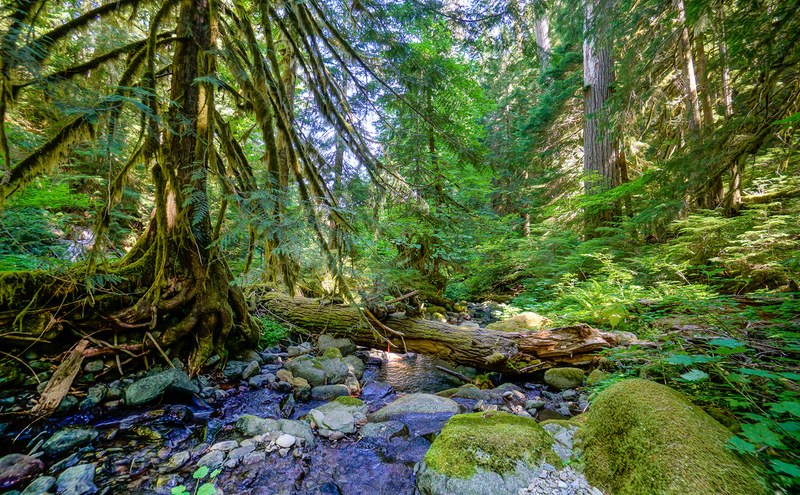 The instrument makes it possible to look at how much synthesis of organic compounds from CO2 (photosynthesis) occurs in the streams, as opposed to an elaborate process in the lab. Francisco Pickens is assisting Mowlds on the BenthoTorch study. A master’s student in fisheries science, he also participated in both the employment and research programs as an undergraduate. He learned a range of different research methods related to stream ecology, which, in turn, generated new questions. “At that stage, I didn’t have any particular focus. I certainly didn’t have grad school in mind; I was only interested in finishing my undergrad degree,” he says. Transitions like Pickens’ were, in part, why the undergraduate research experience was created. It was the undergraduate research experience, along with an invitation from Arismendi, that propelled Pickens into the master’s program, where he is now researching the effect of climate change on aquatic animals living in headwater streams. “I was planning my master’s experiments in my senior year and conducting them a couple of weeks after graduation,” he says. Sophie Pierszalowski is Oregon State’s undergraduate research coordinator. She says faculty who are applying for an NSF grant, or who already have an NSF grant, can request funds to design and implement the program. Those can be in any discipline and the program is open to students at universities across the nation. Pierszalowski also notes that in the past decade or two, there’s been a tremendous amount of work done to try to answer the question of how research experiences benefit undergraduates. “You’ll see in the research literature hundreds of papers that talk about gains that students see from participating in research with faculty mentors,” she says. These range from increased academic persistence to a higher likelihood of going on to a graduate program, increased confidence in students’ academic programs and connections with faculty who can write letters of recommendation and introduce students to other talented people in their field. Pierszalowski adds, “Undergrads who often engage in research find their academic home and become part of a more intimate community in a vast and sometimes intimidating research institution.” For these reasons, undergraduate research has been referred to as a “pinnacle practice” in higher education literature. Mowlds and Pickens couldn’t agree more.